We are well into April now but each day it seems to get colder. 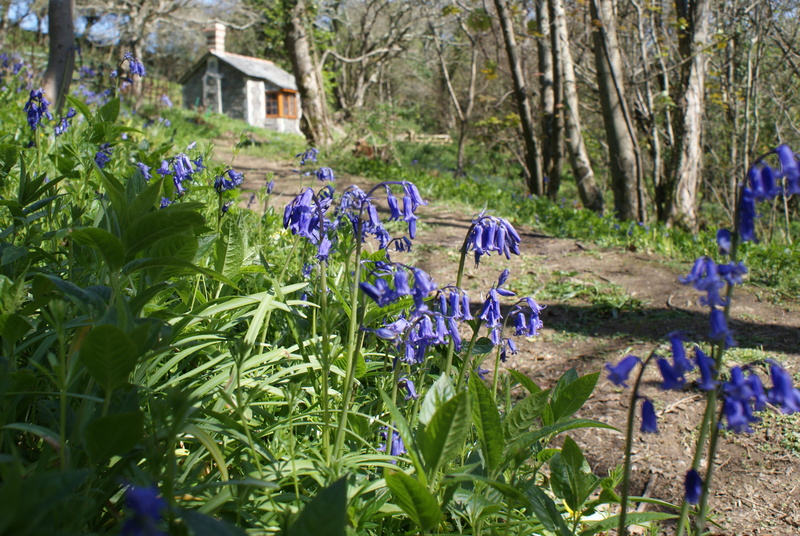 The daffodils are on their last legs but the bluebells are well under way, looking spectacular. I feel quite sure that now it is cold that they will hang on for Bluebell Week which starts on Sunday. The most difficult decision is when to hold an event as each year is so different. This year everything is so early. In the winter Leighton and Dave did a sterling job reopening a long overgrown path leading from the Summerhouse to the Gazebo. It is such a treat to be able to walk to the beach and back by a different route, something that hasn’t been possible since 1914 when the gardeners left for the First World War never to return. In those days two people were fully employed keeping the lovely paths open but sadly nowadays funds don’t go that far! The primroses, violets and wood anemones are spectacular too and for the sharp-eyed the wild orchids are appearing. 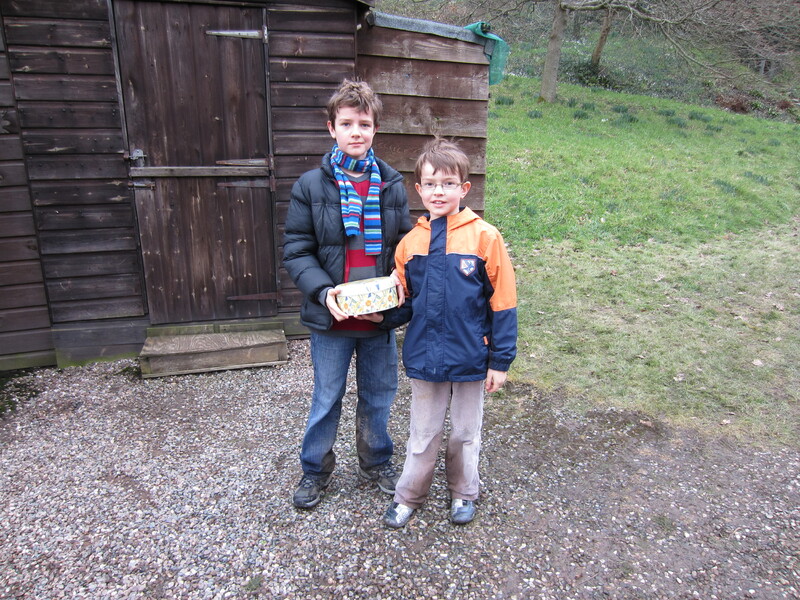 Easter is a great family get-together at Hartland with all the family arriving, some for a week! With four children, their spouses and nine grandchildren, great granny, siblings, other cousins and masses of dogs the Abbey rapidly fills up and the total head count for the Easter Sunday lunch picnic was around 40! Everyone is wonderful and brings contributions to feeding the masses. After lunch the family Easter egg hunt is the highlight of the day ending in lots of happy and chocolatey faces! By Easter Monday we are always exhausted having been full time caterers and bottle washers but happy having been all together again. During the Easter weekend a fox ate ALL our 12 chickens and our two adorable runner ducks. Some were at least five years old and were really sweet friends. Mary was a bantie cross hen and came in the kitchen all the time. I am devastated as not only did they produce the best eggs but were genuinely part of the family. To find your hens and ducks with their heads and legs eaten off is the most horrible sight imaginable. The fox had dig under the chicken run at night. Now we have to get some more but they won’t run into the kitchen and scratch in the garden as they won’t have an older hen to show them. It is eerily quiet and there is noone to give the scraps to, it is really miserable. Joanna Mitchell, who has been our Head Gardener for the past twelve years, ‘retired’ on Good Friday. She has been marvellous for the garden and kept it immaculate for all this time having also helped us with the restoration. She will be sadly missed by not only all of us but by the many visitors who chatted to her over the years to glean advice! 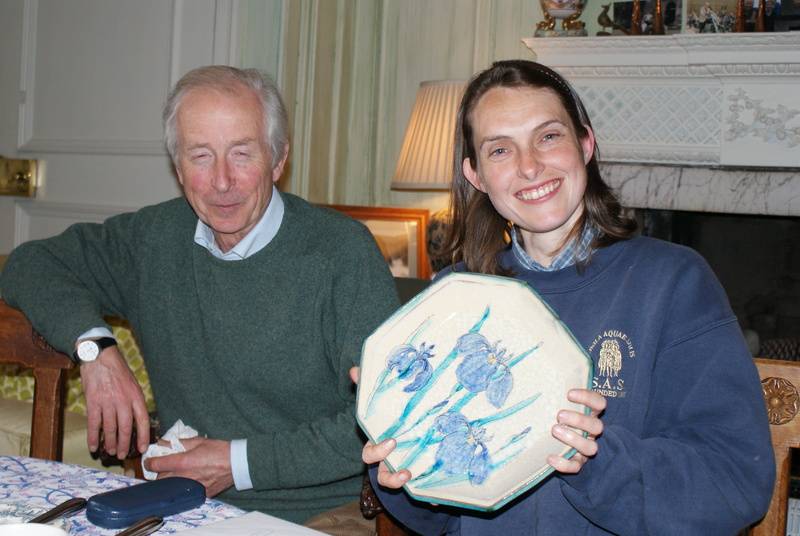 She was presented by Sir Hugh with a plate from the Springfield pottery in Hartland. Nigel Alford, who has helped Joanna part-time for the past twelve years, now takes on the formidable task but we have every confidence that the garden is in good hands. Nigel trained at Bicton College and has also worked for Clovelly and Downes during this period. Sir H has put together an interesting display in the Abbey of memorabilia from the 1936 Olympics in Munich in which his uncle, The Hon John Bampfylde of the Royal Horse Guards, took part. He was a member of the British Fencing Team and a fascinating letter from him to his mother vividly describes the extraordinary atmosphere when Hitler appeared in the stadium. Another athlete, Dan Pettit – latterly Sir Dan Pettit, had ties to the Abbey; he was a master at Highgate Junior School when it was evacuated to the Abbey at the outbreak of war and was a member of the football team. A booklet which they were given at the time, explains how they should continue with gentle exercise before the Games, rather different from today’s training regimes! The gardens are looking wonderful at the moment. 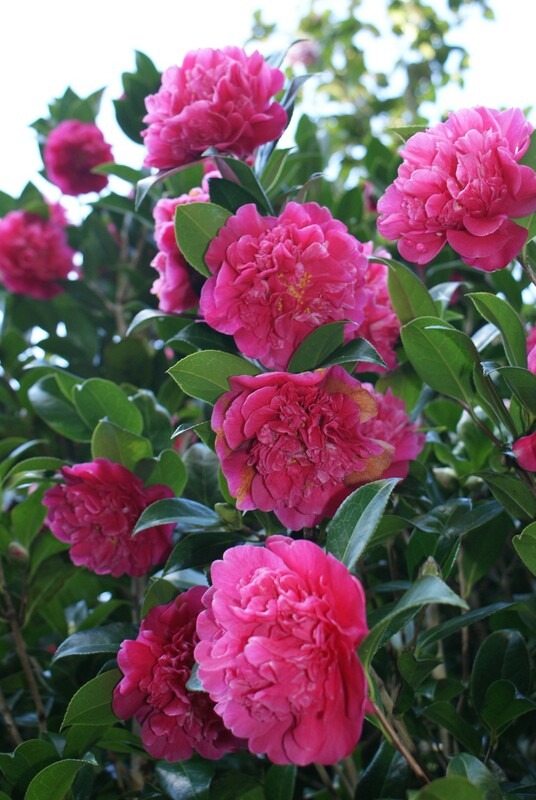 The camellias and magnolias have flowered better than we have ever seen them before; lack of frost has prevented them going brown which has helped. The tulips in the Walled Gardens have started flowering and the azaleas are coming out. Spring is on the way…. 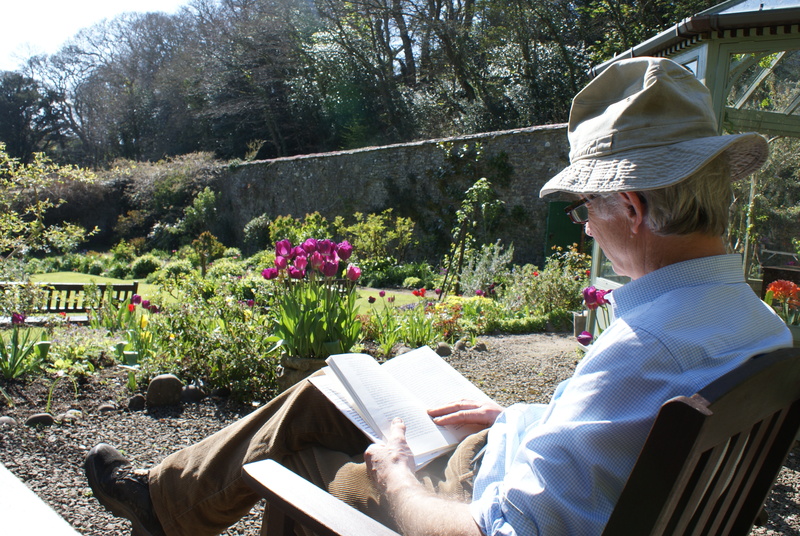 Come and join us for a bluebell day and if you have a moment take time out in the Walled Gardens for a relax and, possibly, even a read in the sun! The walks to the beach, Summerhouse and Gazebo will be looking lovely and The Tea Room in aid of St Nectan’s Church will be open daily during the week of Sunday 22nd – Sunday 29th serving their usual light lunches and delicious cream teas. On Sunday 22nd and Sunday 29th Sam and Em will be doing their barbecue again with that deliciously tempting smell coming from their little tent! Bring lots of dogs and wellies if wet. The house will be open too on Wednesday, Thursday and Sundays. Do come! We are now open regularly for the season. See www.hartlandabbey for all the details of opening times etc. This is always a manic time of year at the Abbey with so much to get ready for the coming season and consequently no time for self indulgence BUT I just can’t miss the Cheltenham Festival on the teli. Channel 4 is so brilliant with its coverage and this year we had four days of four hours, thus sixteen hours less time to dead head hydrangeas (positively the worst job) at the Abbey! This is my holiday which I look forward to every single year, much to my husband’s delight as it costs him nothing! My family have always been very keen on the racing and some of my first memories are with my nanny pushing my sister in the pram on the course at Royal Ascot while my parents spent the day with their friends in the Royal Enclosure! Our nanny was very keen on betting and was also very energetic pushing us from start to start to see the horses and jockeys; I am talking about the early 1950’s! We used to wave at The Queen and The Duke of Edinburgh as they came through the Golden Gate in their carriage – very happy days. Our son-in-law Tom Scudamore, who is married to our eldest daughter, is a jockey; he had lots of rides at Cheltenham this year which made my ‘holiday’ much less relaxing as I hide my eyes in the chair when he is riding as I am always so nervous for him. The first two days went well except for the disappointment of Grand Crus in the RSA Chase but all went much better on theThursday with a wonderful win on Salut Flo in the Byrne Group Plate Handicap Chase. Much the most nerve wracking was his ride on The Giant Bolster for David Bridgewater in the Gold Cup. This horse, which was 50-1 with the bookies, has a history of not being the best of jumpers and last year put Tom on the sidelines for 5 months with a shoulder injury. With my head in the chair and ears blocked I emerged just before the last fence to see the unexpected sight of The Giant Bolster and Tom in front but unfortunately AP McCoy was looming large to spoil the party! A second in the Gold Cup was an incredible success for all concerned but to see horse and jockey in one piece is, to us, the most happy outcome. Then as if that wasn’t enough, Tom won the Midlands Grand National at Uttoxeter on Saturday on the gutsy Master Overseer, an end to a wonderful week for him and David Pipe. 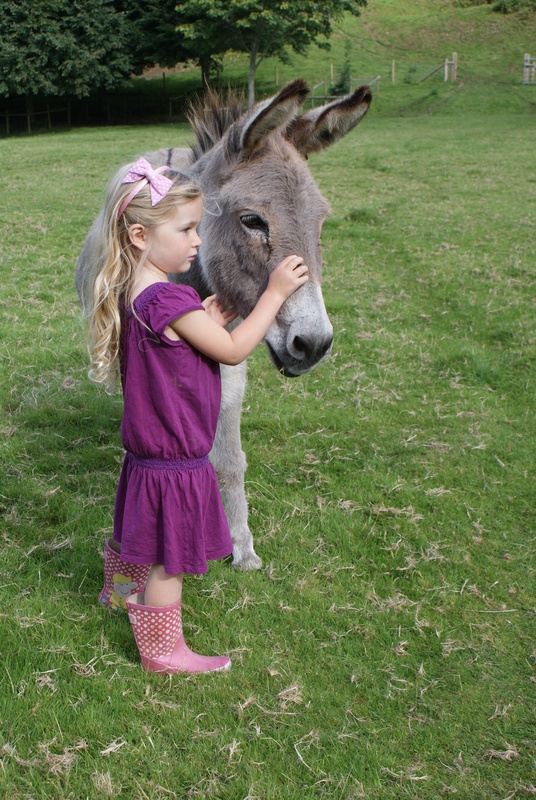 We had a great sadness last autumn when we lost Snowdrop, the oldest of our three donkeys. Bluebell and Nutmeg were very miserable without their sister and I think now we should look for a surrogate ‘sister’ for them. The donkeys are so sweet and such an attraction to so many of our visitors but we need to find a very friendly soul as, and I am crossing my fingers, up until now they have never bitten or kicked anyone! If anyone should know of a quiet donkey that needs a lovely home where she will be utterly spoiled then please contact us. The two donkeys will be coming back to Hartland from our farm where they overwinter along with lots of the black ewes and their lambs. We have to be careful not to bring the lambs back too soon as the small ones will be eaten by the huge fox and badger population which has sadly decimated our peacocks and guinea fowl this winter. Thank you to everyone who came to our Daffodil Weekend. Saturday was quite quiet and peaceful but Mothering Sunday was so busy in the beautiful weather. Lots of families brought their mothers for a day out in the spring sunshine. The daffodils and narcissi have not behaved very well this spring with many of the later ones refusing to come out in time but there were still enough earlier varieties to make a show. We have found that many of our older, historic ones are blind this year but they did flower particularly well last spring. Some bluebells are already out with primroses, violets and wood anemones and lots of camellias but this coldish weather will keep everything going until we open for the season on April 1st. The greatest selection of dogs appeared and the joy of these early days is that they can be let off the lead before the sheep come back; there were lots of exhausted dogs and owners and not a single dog fight! Plenty of families joined in with the Treasure Hunt but the winners by a long way were the Whiteley family (left) from Westward Ho! It is quite a demanding task with the clues spread over a large area (it is designed to exhaust children) and quite a few don’t make it to the finish! Congratulations to Summer and Nalani Whiteley for their determined effort. Now its back to dead-heading hydrangeas, sprucing up the holiday cottages for Easter, renewing the notices for opening and thinking of all the food that I am planning to cook for all the family coming for Easter – and buying Easter eggs for all the grandchildren, of course! Carol, my right hand, has spent all winter spring cleaning, painting the tea rooms, killing woodworm and hoovering up flies which love the Abbey in winter. No end of fly papers, sprays etc can even begin to make a difference and my husband says we mustn’t put smoke bombs in the roof as the fire alarm will go off. Oh dear, any ideas would be very welcome! We will be opening the gates and doors again on April Fool’s Day for the season, but it isn’t a joke! 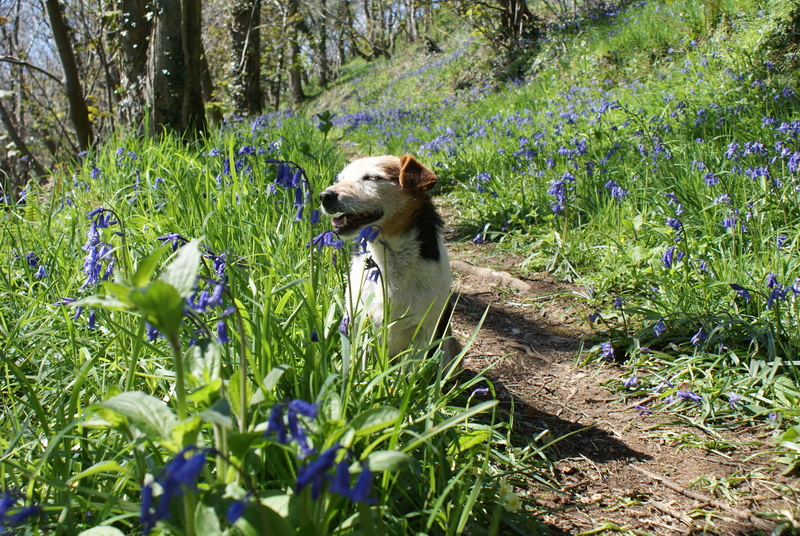 Our next wildflower event is Bluebell Week from 22nd – 29th April when the admission will be £4 again. Hope to see you then. Just back from Scotland with more than I bargained for – flu! I spent all week up there nursing my ill family only to bring it back down here with me to infect the south! But it was well worth it, just being with them. I visited Dawyck Gardens (part of Edinburgh Botanical Gardens) which is very near our daughter; the snowdrops there are magnificent and if ever you have the chance to go it is lovely. Their cafe is the best too! We have definitely decided to hold a Daffodil weekend on Saturday 17th and Sunday 18th March rather than just Daffodil Sunday. People now have the choice to visit on either day (see the page on our website). Hopefully the Sunday will be a beautiful day and children (of all ages!) will be able to bring their mothers for a day out on Mothering Sunday. 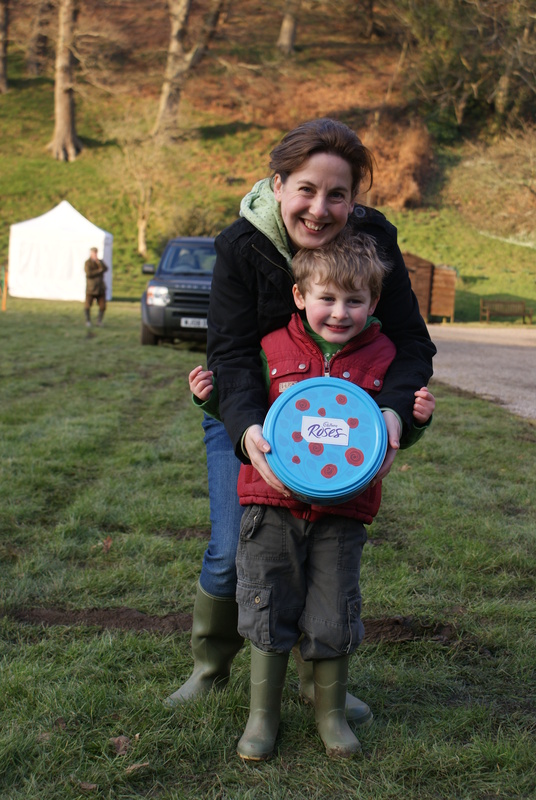 We will again be having the Barbecue and the Treasure Hunt, both new and very popular on Snowdrop Weekend. We thoroughly enjoyed watching last Sunday’s instalment (the last from Hartland Abbey) of the BBC Antiques Roadshow. It brought back memories of last summer and all the work putting on the Roadshow but the immense pleasure, at the end of the day, of over 3,000 people coming with so many fascinating objects. We were so busy at the time that we never saw much of the filming except at the very end of the day. Thank goodness I didn’t see the tooth extractor, I think I would have fainted on the spot but I wish I had seen the cuckoo clock! We have got one remaining available week left at Blackpool Mill Cottage in the summer on Friday 8th June, due to a cancellation; there are September dates too. All the details are on our holiday cottages page of the website. PS I still haven’t worked out how to textwrap this so I am sorry if it looks rather odd but I didn’t want to disappoint the children! 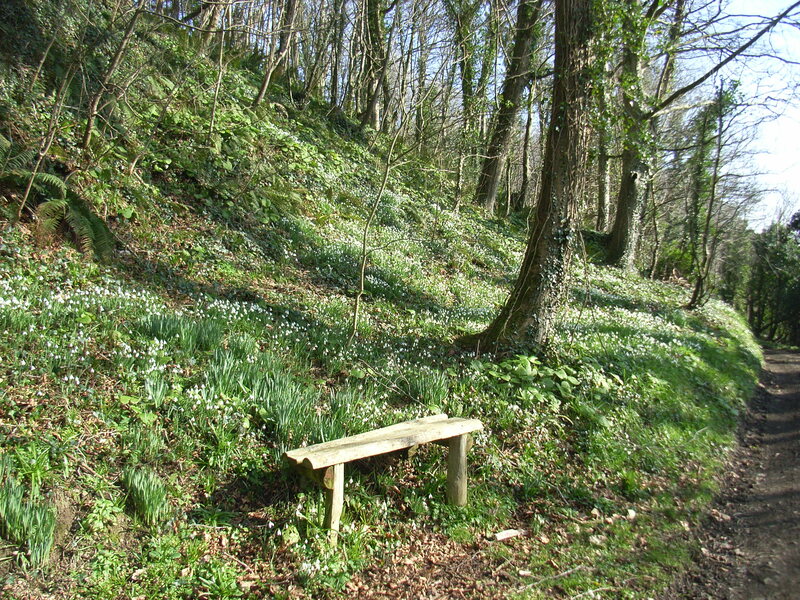 Thank you to everyone who came to Hartland Abbey last Saturday and Sunday and supported our Snowdrop Weekend. We were exhausted but very happy as over 1000 of you turned up with nearly as many dogs of all shapes and sizes; they were the sweetest collection of North Devon (and further) dogs imaginable! If only it was a warmer time of year as a Family Dog Show would be such fun but sitting around watching in February would not necessarily be very comfortable! We also held our inaugural Hartland Abbey Treasure Hunt which had taken ages to plan; I was very worried that it would be chaos with everyone getting lost but it did seem to work and was fun (and hopefully slightly educational)! We had some very worthy winners in Emma and Harry Marshall from Landkey on Saturday and Will and Callum Baker from London on Sunday (photos to follow when I am back from Scotland)! They all looked delighted with their prizes of biscuits and chocolates. Saturday was such a beautiful day and although Sunday wasn’t sunny, at least it stayed dry after the overnight rain. Sir H announced at breakfast on Sunday, at his most pessimistic with head in hands, that “everyone will get stuck, I will have to push everyone out, I have got a bad back and I won’t get in until midnight; we will just have to shut the gates when the gravel parking is full up and not let any more in”! I pointed out that if people have driven miles to get to Hartland that they would not be very pleased to find the gates shut especially with the cost of petrol so high and in this time of tweeting I doubt anyone would have visited us ever again! By nightfall, when the last car was leaving, only a couple of people had needed pushing and he looked very happy (and relieved)! The grass parking is fine later on but this early in the year the sun hardly gets in the valley to dry it up. Thank you to everyone who helped out both in the house and outside during the weekend: to Colin and Mick on the gate, to Mary for sustaining us all with non stop coffee, soup and pasties, to her husband, John, and mine for parking everyone and to all our stewards in the house. Also to Carol, Dave, Leighton, Joanna and Nigel for getting the house and garden back into shape after the winter. Also big thanks to all the local media for helping us to get the message out to the big, wide world, your support is hugely appreciated. Nancy and Sue run our fantastic tearoom in aid of the church and they really did do well keeping everyone well fed; they have wonderful helpers and produce scrumptious home made scones and cakes. 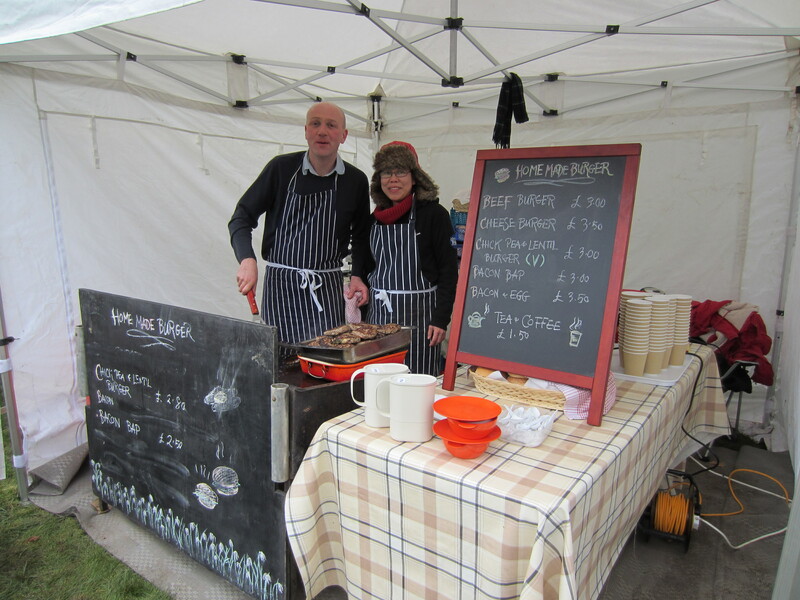 This year Sam and Em from Barnstaple brought their barbecue too and cooked up delicious home made burgers and bacon sarnies; the smell was tantalisingly delicious and we hope they will do the same at future events. What a difference a day makes. Early on Monday I caught an aeroplane up to Edinburgh. I left a cloudy and cold Devon behind only to arrive in Scotland to a warm and sunny day; spring has arrived up here! As I looked out of the aeroplane window I was reminded of our wonderful friends, Les and Maggie Ginger of Kelland Signs, who have always done our signwriting for Hartland Abbey but much more famously make all the Flybe regalia which I could see on the, luckily, working engine! Now I have a few days off visiting our daughter who lives near Peebles; it is such a joy to see the grandchildren and have time with the family. I say “days off” which is a bit of a misnomer but we both feel so lucky to have grandchildren, nine at the last count! It won’t be long until Daffodil Sunday on 18th March which is always lovely with all the masses of historic daffodils out; this year it falls on Mothering Sunday so hopefully lots of families will come along. We are thinking of having Daffodil Weekend, the Saturday as well as the Sunday, but will keep you posted. We think it is better to spread these events over two days to give people a choice of day (and weather)! There is so much coming up this spring and summer; all the dates and events are on our website. Our new leaflets will be out soon too. Don’t forget to watch The Antiques Roadshow on Sunday night at 7.30. 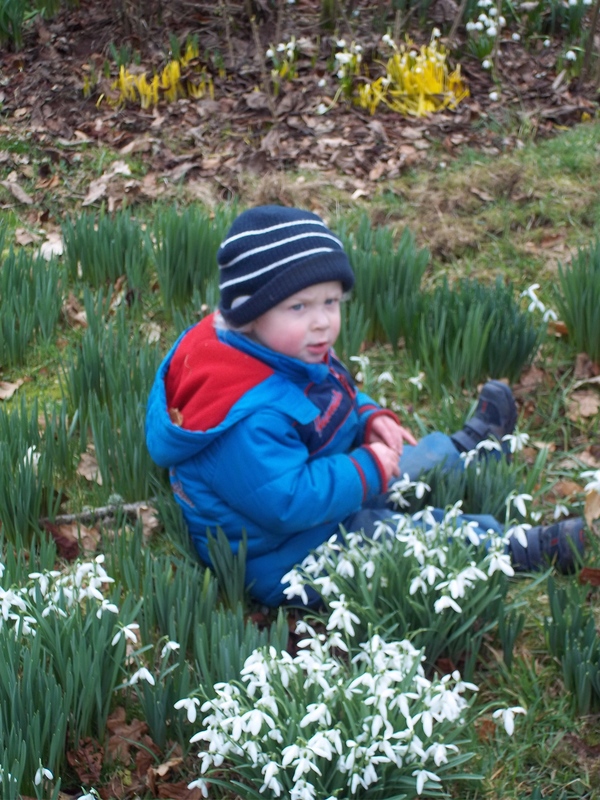 Come and enjoy the snowdrop days 11th & 12th February 11am – 4pm.